Imagine what it would be like to own a magic mirror that could see into the future. Everyday you’d stand in front of it and see what lies ahead. Oh the questions you could ask it. 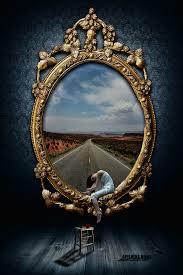 Mirror, mirror on the wall, what’s my future after all? Sure there are times when a little inside knowledge couldn’t hurt. Will I get the job? Is a new home in my future? Will I find love? But what if you ask a question and you don’t like the answer? This will be your future after all. Are you prepared for the outcome? Everyone has good and bad events that happen in their life. Knowing the future means knowing the bad parts as well. Does he really love me? Can I trust them? What about my health, what about my families health? There are some things that knowing the outcome could actually hurts your life in the present. What good is having hope if you know it won’t help. Why take a chance on a love if you know it is only going to end with a broken heart. Why live a healthful active life now if you know you will be sick later in life. Hope and faith are human traits that propel mankind to strive, survive and excel. They do not rely on facts, hope and faith rely on possibilities and curiosity. If you were able to see the future you would soon lose the desire to create. Unless you saw in that magic mirror that your idea would be a success, what would be the point to try if you knew that you would only fail. So while you gained the magic of knowing the future, you would lose the magic of excitement, wonderment and serendipity especially the possibility that your failure could result in an unexpected discovery as so often happens in life. 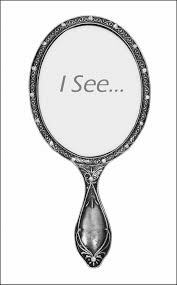 Thankfully, there are no magic mirrors, or at least of the physical variety but each human does possess their own magical inner mirror and it is called insight. When we take the time to “reflect” on events we gain a greater knowledge of what has happened. Through our own inner reflections we are able to come to terms with the past and create our own future based on the inner self knowledge we receive. For me, I’ll take the joy of surprise over the certainty of knowing what lies ahead. I’ll choose hope and faith over surety and guarantees. I want to feel all emotions available to humans, both good and bad, happy or sad because those feelings are what give pleasure and wonderment to our souls experience here on earth. I love surprises AND have a need to know what’s coming…looks like I am still a work in progress Diana! Expecting the Unexpected has allowed me to be less severe in the control area as I age – yay!